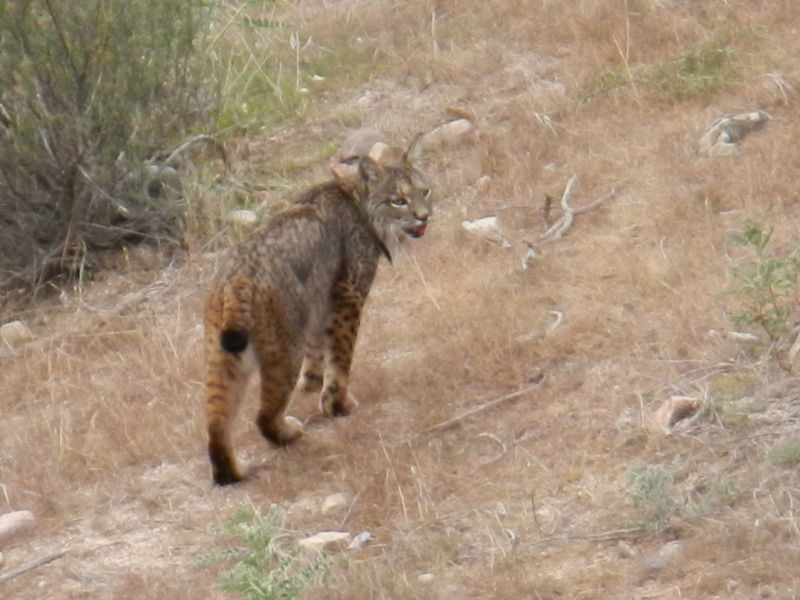 On Boxing Day, I was lucky enough to be heading out to Sierra de Andújar in Southern Spain to look for the extremely rare Iberian Lynx (Lynx pardinus), of which there are only a few hundred left in only a handful of sites. Sierra de Andújar is a natural park, which can’t be called a national park as most of it is privately owned by deer and boar hunters. However, there is a road running through it and across the sides of sandy, shrubby mountains that gives the Lynx watcher an excellent view of the surrounding area. I have nicknamed the road the ‘Lynx road’. We had an excellent guide: the Tour Manager of Birdwatching Spain, Pau Lucio. As well as having great knowledge about the Lynx and other wildlife, he also knew the best spots to find each species. As well as a few distant views of the Lynx, we had one amazing sighting. We had just returned from a trip to explore one of the dams in the park and we stopped at Pau’s favourite spot along the Lynx road to see if anything would show up. We noticed that there were a lot of people (50 or so) hurrying around the corner with their telescopes. 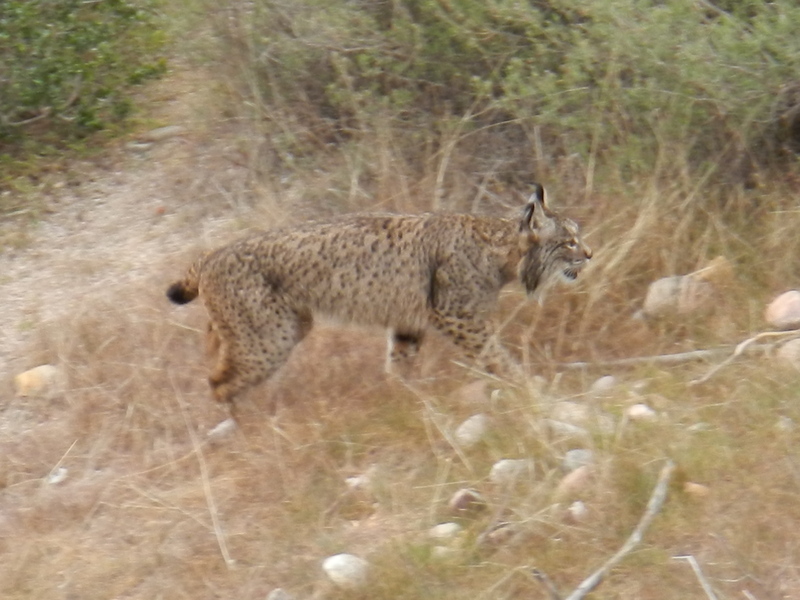 Pau asked them in Spanish if they had seen anything and they said that a Lynx was coming around the mountain corner about 70m from the road, which was closer than one had come to me before. We stood waiting for the Lynx to appear for quite a long time. I spotted it first when it came around the corner, but typically, as soon as I took my eye off it to show the other people where it was, I lost it. They have such good camouflage! I only saw it again once it had walked 50m further away from us and reached a firebreak. But then it started to walk along the firebreak towards a stretch of the Lynx road, so a few of the Lynx watchers and I went to that stretch of road hoping that it was going to cross there. Inevitably we couldn’t see the Lynx when we got there, but it definitely hadn’t crossed the road. Suddenly I heard some noise from a group behind us and I turned to see them frantically gesturing for me to come. It must be the Lynx. It was, and it wasn’t even walking away from us! It was actually walking towards us and looked set to cross the road in front of us! It was on relatively open ground so I got a few nice photos of it walking towards the road, but no good ones of it crossing the road. This was because it bounded across, which surprised us as it was so calm before. Pau said that the moment it touches the road, it knows it must run. Good Lynx. The biggest reason for the Lynx’s decline is road accidents. At the end of the trip, we watched a slideshow compiled by some of the guests of the villa in which we were staying, who visited the area two years ago. I learnt quite a lot, even though it was in French. One of the points that was very powerful was that in thousands of years no cat has gone extinct but there is a real danger of the Iberian Lynx being the first. However, the population is increasing. When at its lowest point there were only around 100 individuals, compared to today’s 300. 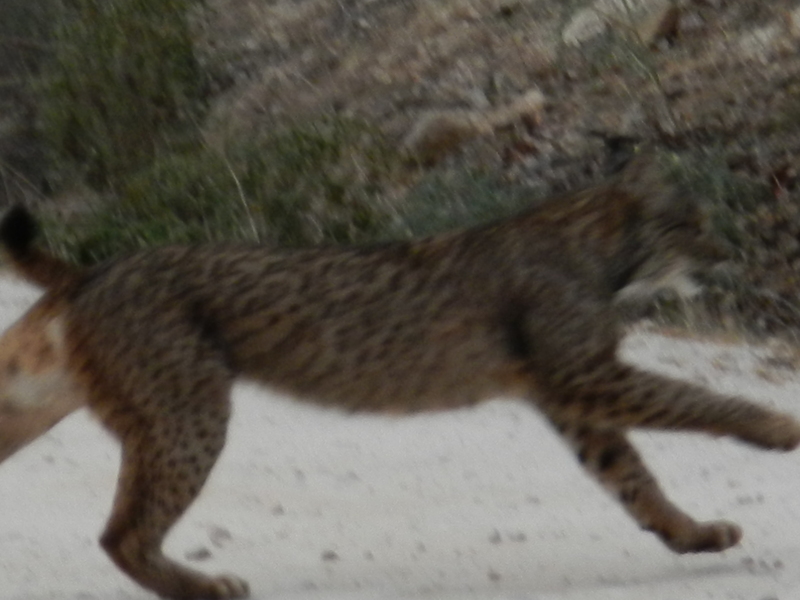 Hopefully the Iberian Lynx population continues to increase.